It is no secret that I like Bruichladdich whisky. 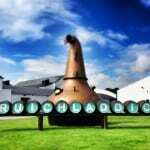 But my appreciation for the distillery isn’t just about good single malts. 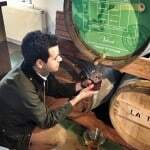 Its recent history has been fascinating, from its resurrection by Mark Reynier in 2000, to the bittersweet purchase by Rémy Cointreau for a staggering £58 million in 2012. 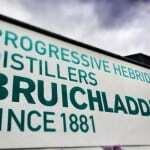 I like that Bruichladdich has tried to resurrect the Port Charlotte facilities, too, even though that operation has not quite come to fruition – though the whisky has. 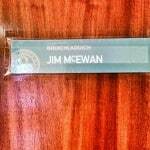 I’ve enjoyed master distiller Jim McEwan’s experiments and his team’s progressive attitude. They’re always trying brave things, even though not every dram has hit my sweet spot. Arguably they’ve changed the whisky industry, too, by showing just what can be done when you strip the bottle of age statements. That experimental attitude is now clearly being shared by many other distilleries these days. But I must admit that, when the sale to Rémy went through, I feared some of that feisty independence would be corporatised lost. After my visit, I’m utterly convinced that the opposite has happened. Whether their owners know it or not, Bruichladdich is turning things up to eleven – the future holds a huge amount of potential. 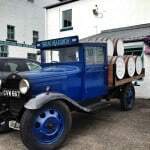 That I was an admirer of the distillery had not gone unnoticed. When I tweeted about my honeymoon visit, the Lord of Digital at Bruichladdich (a.k.a Carl Reavey) made a note to find me during the tour. But before I get to that part, just how many distilleries would go out of their way like that? How many would actively use social networks to build real connections, and not merely use them for marketing 101 tweets (e.g. “Hey, potential consumers, what’s the best way to enjoy our Whisky X? Pls RT our product”). 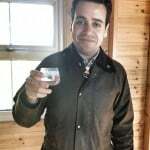 Connections, I discovered, are really what Bruichladdich is about – from the online social networks, to the physical social networks and community on Islay. 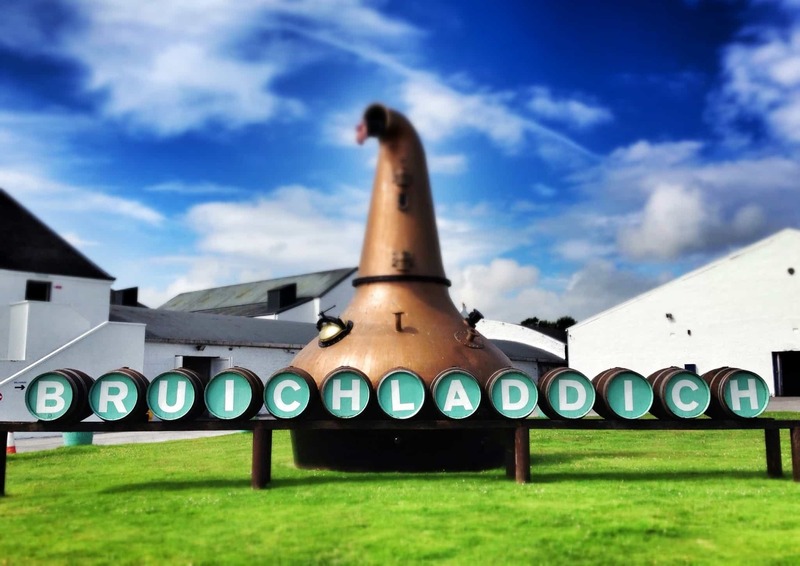 Bruichladdich employ about 80 members of staff, which makes them one of the largest employers on Islay. That’s profound on an island so small. 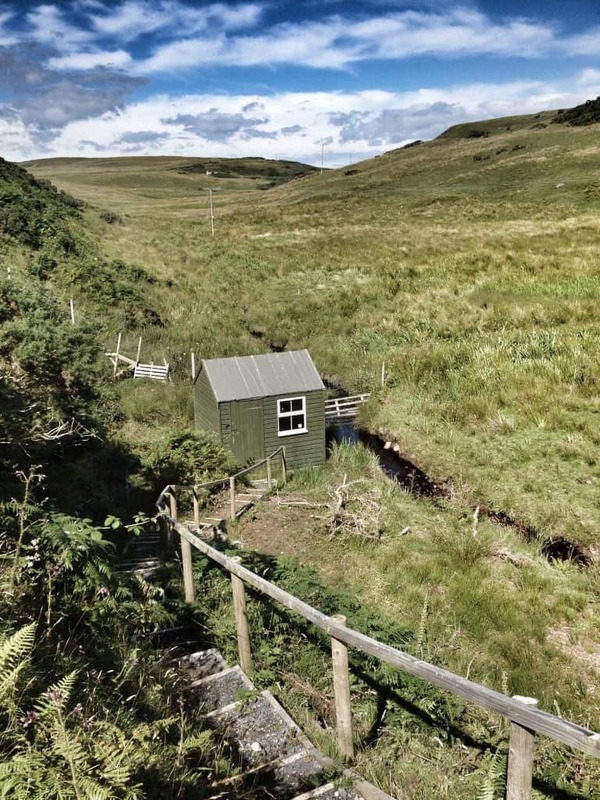 Remember that for a good while the distillery stood dormant, many locals without jobs and the nearby settlements of Bruichladdich and Port Charlotte standing in an undignified state to say the least. 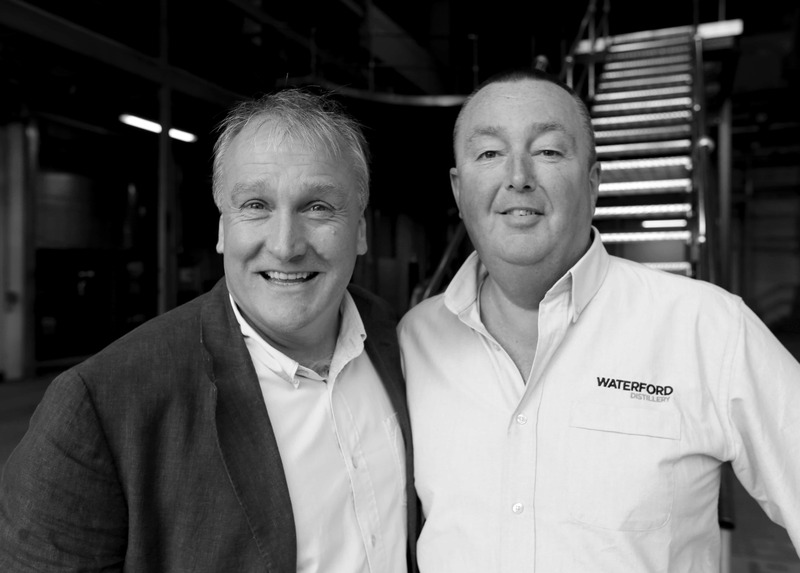 Mark Reynier’s team not only rebuilt the distillery, but totally reinvigorated that community. They use Scottish barley and, where possible, it comes from Islay itself – think of what those secure contracts do to help farmers in a tough industry. These little ripples have helped boost the island economy, no doubt. Bruichladdich is located on the shores of Loch Indaal, about 20 minutes from Bowmore, which you can see on the opposite shore – Islay weather permitting. Bruichladdich seemed to me to be a medium-sized distillery for the island, which makes that employment ratio even more impressive (for example, I saw just four people at Caol Ila). 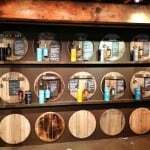 The visitor centre is part surf bar and part whisky shop. There’s a buzz about the place. You get a warm welcome from Mary and her vibrant young team as soon as you step through the door. 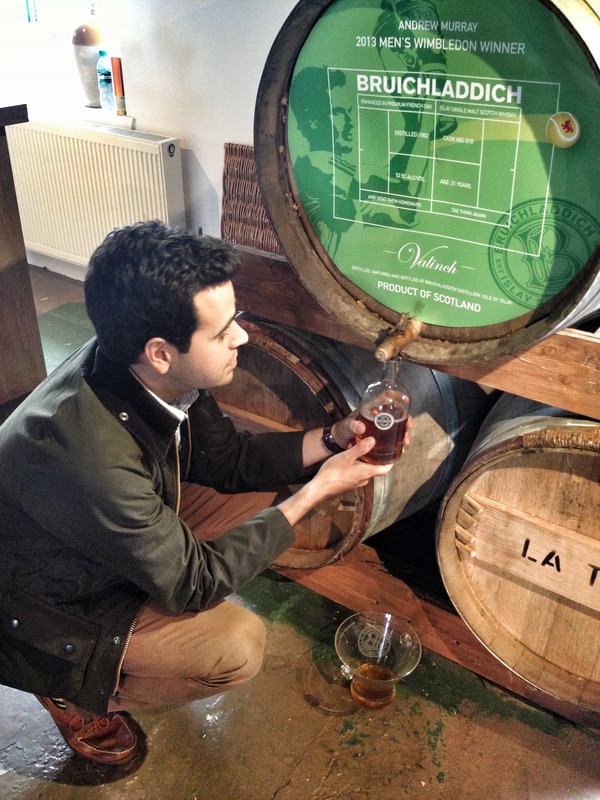 A dram is almost thrust into your hands before the tour – no bad thing, even at 10am. A vast range of bottlings could be seen on display, some not for sale and purely for the heritage factor. But a lot were on sale. 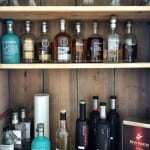 Of course, Bruichladdich produces a lot of different types of whisky – from Port Charlotte and Octomore to the unpeated main Bruichladdich range. One of the suggested outcomes of the Rémy purchase was a streamlining of the range. Well, I don’t think that their wide selection is going to be reduced any time soon. In fact, I’d say even more whisky is coming, much to my delight. 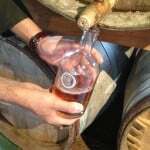 What I also liked about the shop was that you could fill up a special Valinch bottling yourself, straight out of the cask. This particular day featured a 21-year-old Andy Murray Wimbledon victory celebration whisky. That just makes the visitor experience just that extra bit cooler, but I’m genuinely surprised no other distilleries on the island has thought to do the same. The tour itself was good fun, and our guide, Jessica, was extremely knowledgable; she was entertaining and gave a good narrative. Visitors were able to see a lot of the production areas, and could take photos wherever they went (unlike, say, Ardbeg). The distillery is properly old-school. There are no computers here, just a blackboard. Much of the equipment is Victorian and splendid, and probably quite labour intensive – hence the large numbers of employees. And there are some rather unique things on site. 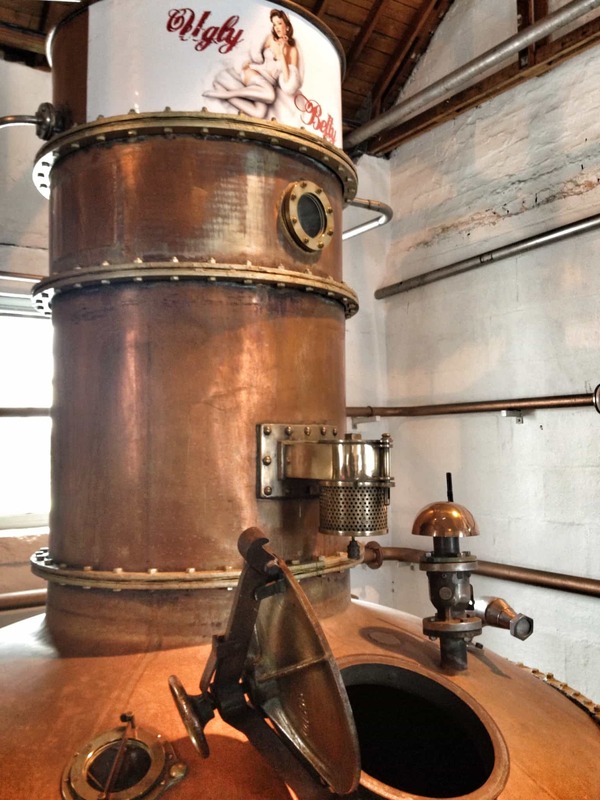 Ugly Betty, pictured here, is an unusual still – apparently she’s not good for whisky, but she makes a splendid gin. 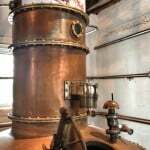 I was stunned to hear that one distillation run makes a staggering 250,000 bottles! To be more specific, Ugly Betty goes to make The Botanist gin, which uses 22 plants found on Islay itself – again, even though it’s not whisky, there’s still that Islay terroir. Anyway, back to whisky. We chewed on barley that was unpeated, and barley that had been peated for the Octomore range – the world’s most heavily peated whisky. Apparently they’re experimenting to exceed the current 168ppm to an eye-watering 300ppm. We were able to sample some unpeated raw spirit that had come pretty recently off the stills, and which was still pretty tasty. What’s more, we were encouraged to rub our hands and faces with it! After this, our mugs stinking of barley, we headed back inside for a sample dram from a range of options. As mentioned above, Carl caught me and my wife at this part of the tour and took us to the Bruichladdich offices for a natter and a dram. We got to chat about loads of cool things, very few of which I can talk about – sorry! – but it only made me love the distillery so much more. I was more than reassured that Bruichladdich’s independent streak really isn’t going anywhere. Carl’s a very cool chap with a heck of a life story. It was great to hear about what drew him to Islay from his (and my current) hometown of Nottingham, to see how he settled into island life and eventually came to work with Bruichladdich. At that point he even brought out a bottle of The Botanist for my wife, as a honeymoon gift. All of this wasn’t necessary, of course, but it was such a wonderful moment for a whisky geek like myself. 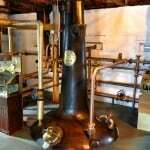 It helped cement that connection between myself and Bruichladdich. It made the distillery really mean even more to me and my wife – who promptly bought the distillery tartan scarf from the shop. I also emptied my wallet there, but that was mainly for whisky. These days a much more approachable shed marks the spot where the spring is to be found. The Octomore water is piped up to be used directly in the production of the whisky – taking drams down from cask strength to 46% ABV for the standard range. This will be going up to 50% in future, if I heard correctly, which is impressive for standard bottlings. Luckily, while we were there, we got to sip directly from the Octomore spring. The water was so nice and velvety, it’s ruined tap water for me completely. All in all, this visit was something special. I got to see behind the scenes of my favourite distillery, and everything I saw made me appreciate what they do even more. 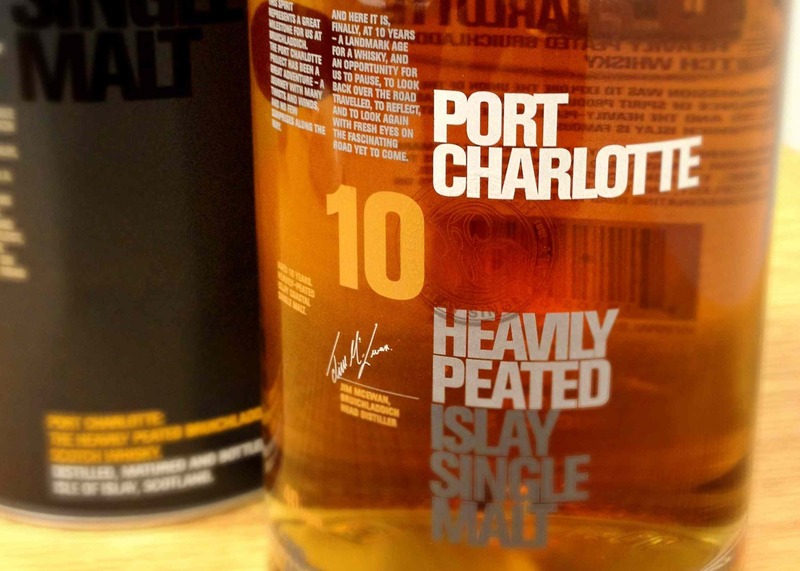 Their quest for Islay terroir and natural whisky is not merely some marketing gimmick. It truly is a way of life for them. Whisky isn’t just something to sell; it’s got passion, it’s got soul. It really is about people and the land. I understood that intellectually before; but I absolutely felt it afterwards. 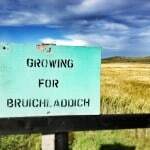 If you’re planning on visiting Islay, I will personally slap you if you do not visit Bruichladdich. I realise my trip contained behind-the-scenes extras, but even so the experience there is the best on the island – from the warm welcome to the selection of drams at the end. If you’re not planning on visiting any time soon, just check out this recent video. It sums things up perfectly. Meanwhile, here are a few extra photos – just click on the image for a better view. 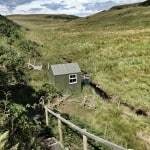 Very nice piece, and cemented my will to go there, sooner rather than later. Sadly, the video is set to private, so can’t watch that. Thanks, Stefan – and I hope you enjoy your trip. Heading back from Kilchoman towards the main road, if there ever was such a thing on Islay, we turned and headed towards Port Charlotte and..